7 April 2010: How it happened? 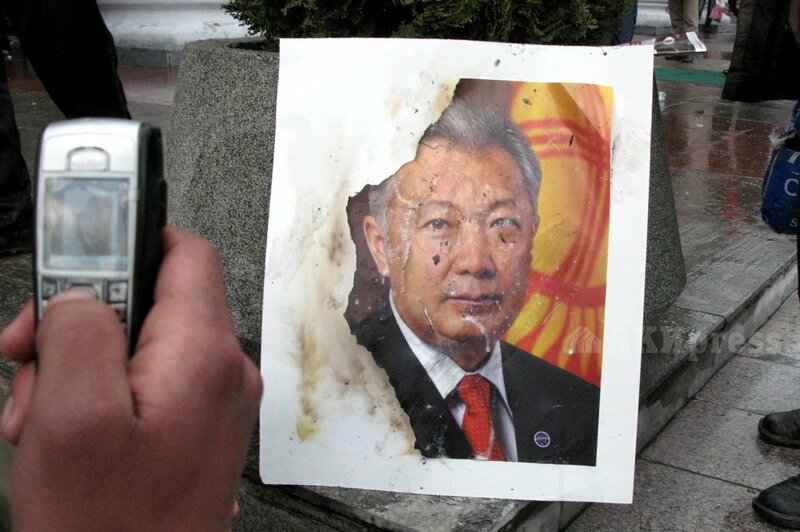 AKIPRESS.COM - Kyrgyzstan today marks anniversary of bloody 7 April 2010 events, which led to ousting of president Kurmanbek Bakiyev and running away of almost entire leadership of the country. 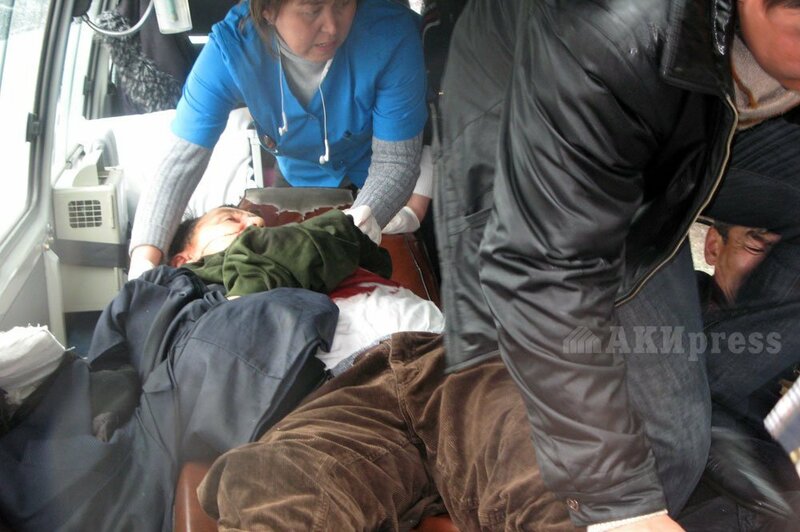 AKIpress looked back and tried to recreate a chronology of events, which its correspondents witnessed on 6-7 April 2010. 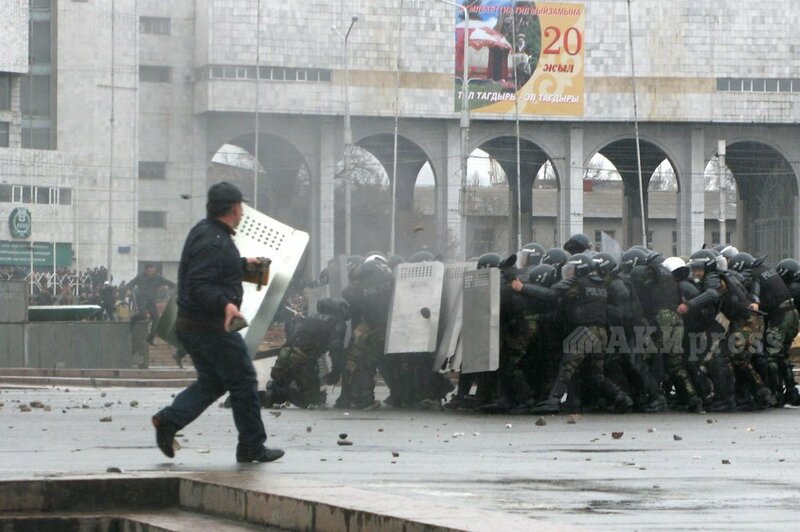 It started out in Talas town, where the opposition members clashed with law enforcers on 6 April 2010, which led to the events on the Ala-Too square in Bishkek on April 7. 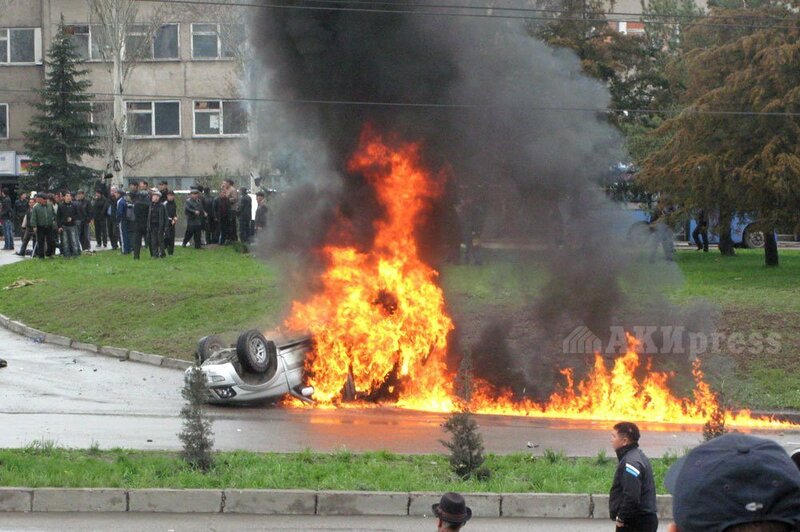 On 5 April, then-Minister of Internal Affairs Moldomusa Kongatiyev warned that he will not let any illegal opposition protests vowing tough measures for any attempt. 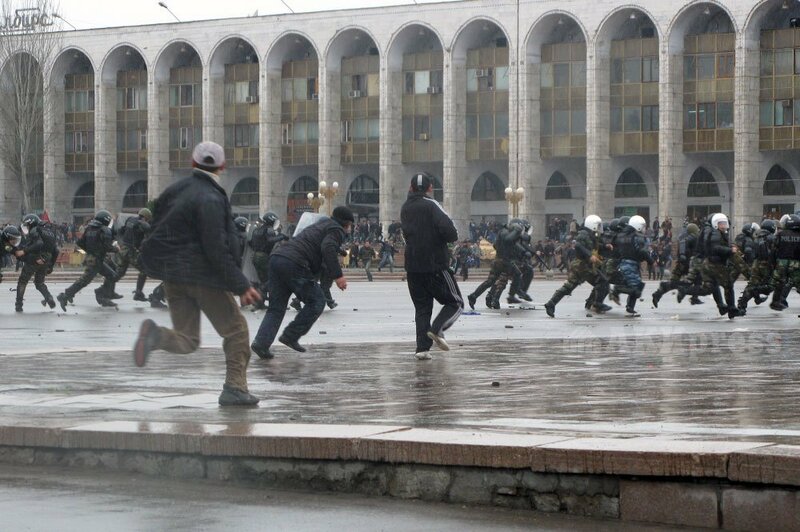 Therefore, opposition protesters in Talas were tried to be dispersed by special forces sent from Bishkek and the southern regions. 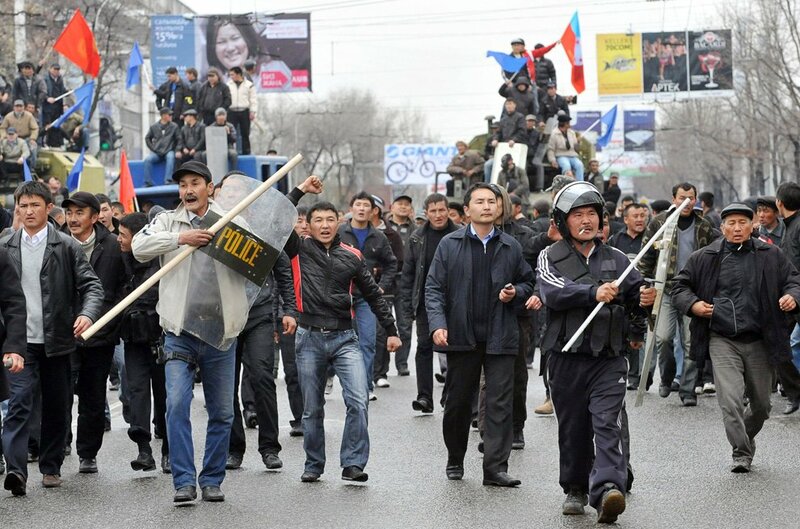 According to human rights defenders’ observation, there were provocative actions, for example, opposition member Bolot Sherniyazov was arrested in front of the Talas regional administrative office by police. 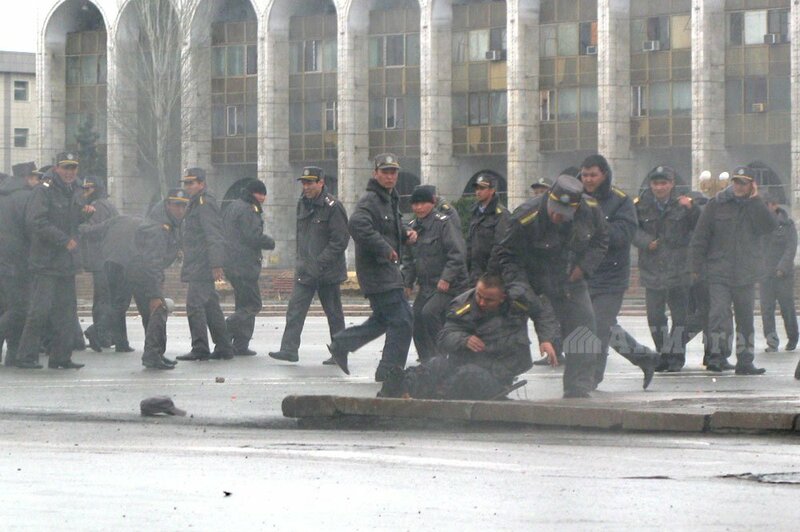 It sparked outrage among Talas people, who eventually attacked the police by throwing rocks. Protesters were dispersed several times, backlash was inevitable at night. 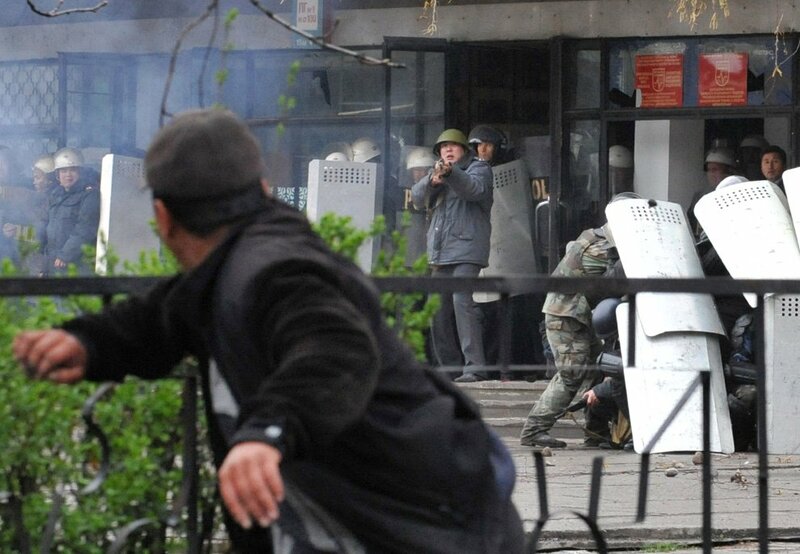 Locals beat up more than 200 special force officers, burned down the Talas administrative building and police department, where policemen hid themselves. Some of the police officers run away and hid in locals' houses. Meanwhile, more than 700 weapons were stolen from the police department, and about 70 detainees escaped from the temporary detention center. 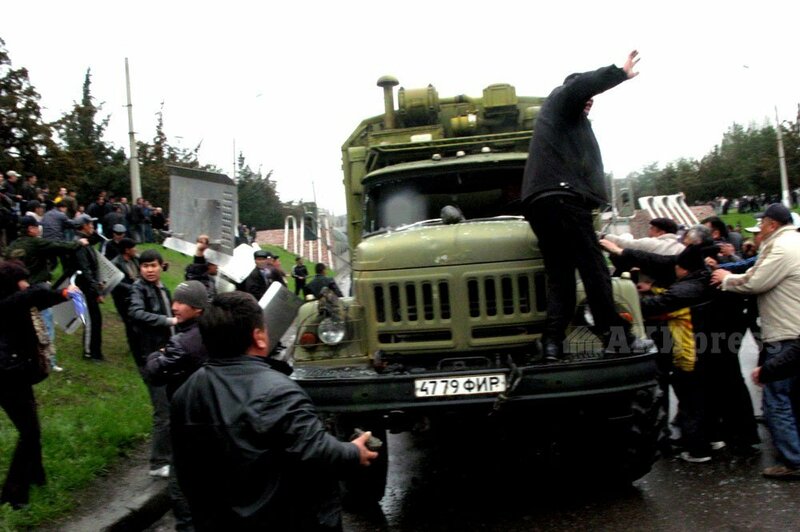 Then-Minister Kongantiyev, with few troops and then-Deputy Prime Minister Akylbek Japarov, arrived in Talas to stop the riots. 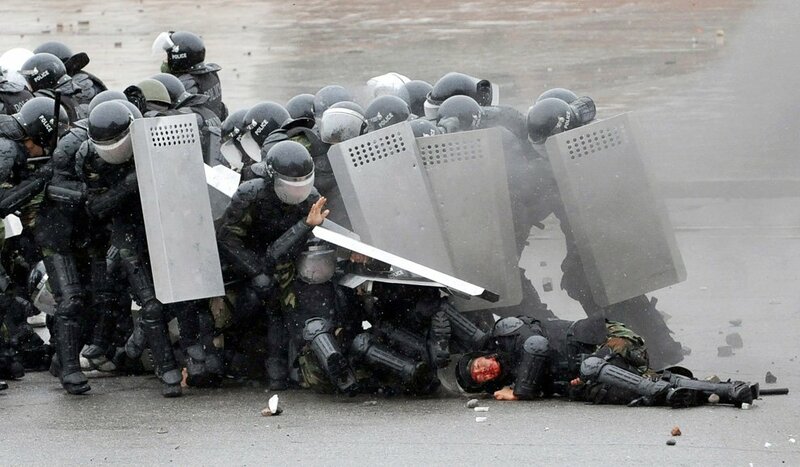 But his troops were destroyed, which allowed the crowd to capture Kongantiyev, who was severely beaten up at that night. 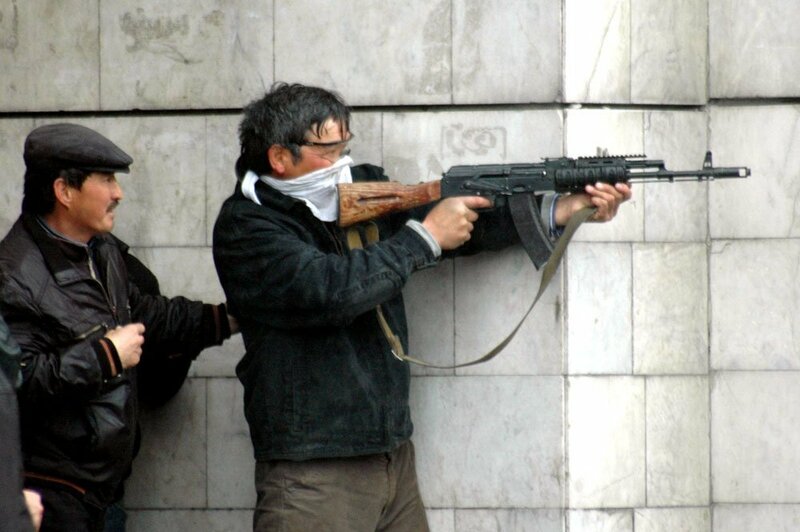 Japarov, who was leading a special operation in Talas, has disappeared and found safe and sound a couple of days later. 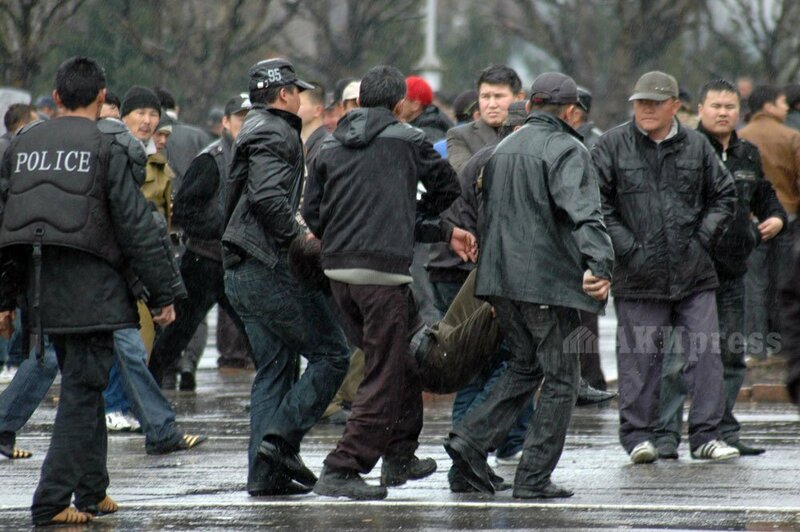 On the night of April 6 to 7, special security service arrested majority of the opposition leaders: Almazbek Atambayev, Temir Sariyev, Keneshbek Dushebayev, Omurbek Tekebayev and others. Roza Otumbaeva, another opposition member, was not arrested and her location was kept in secret. 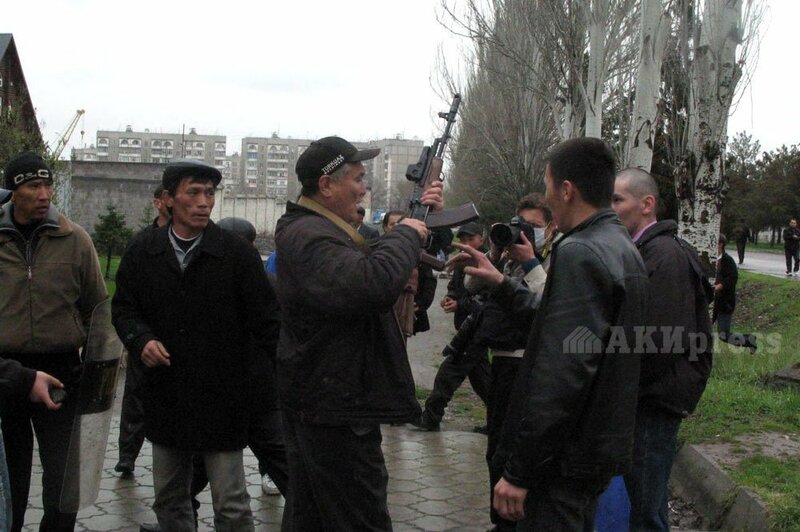 On the morning of April 7, then-Prime Minister Daniyar Usenov gave a big press conference about demonstrations in Talas. During the press conference, he called the protesters “bandits” and assured the journalists that the situation in Talas was normalizing. It was not. After a number of questions, he voiced some facts, which gave a hint that the special forces in Talas were defeated. For example, he said that 15 police officers were missing, and two shotguns were seized. Meanwhile, journalists already paid attention to the outfit of the presidential office's press service employees: their dress-code suddenly changed to sportswear, but they always wore business suits. While Usenov was giving out doubtful information to media and the country, the opposition representatives began to gather next to “Forum” company's building in Almatinskaya st.
Police acts were seen provocative here, too. They began to chase gathered people who did not do any harm, blocked them in one building, destroyed entrance part, and crumbled doors. 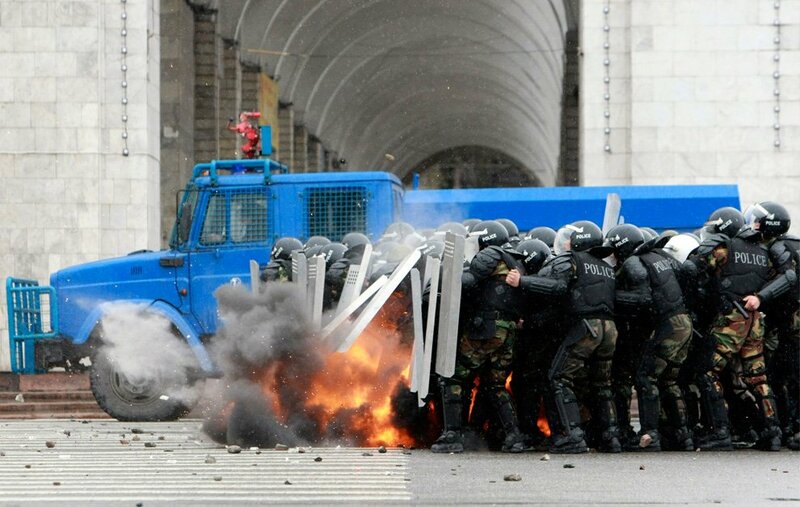 At about 11 am, despite special forces actions, demonstrators were able to overthrow the police and additional “Alfa” special forces of the National Security Committee. 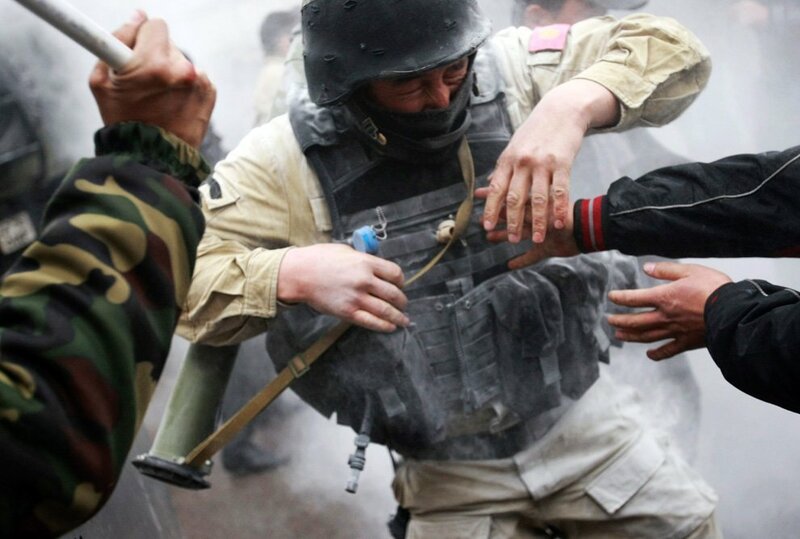 The special forces were severely beaten up by the crowd, but some of them carried away injured ones from the crowd. 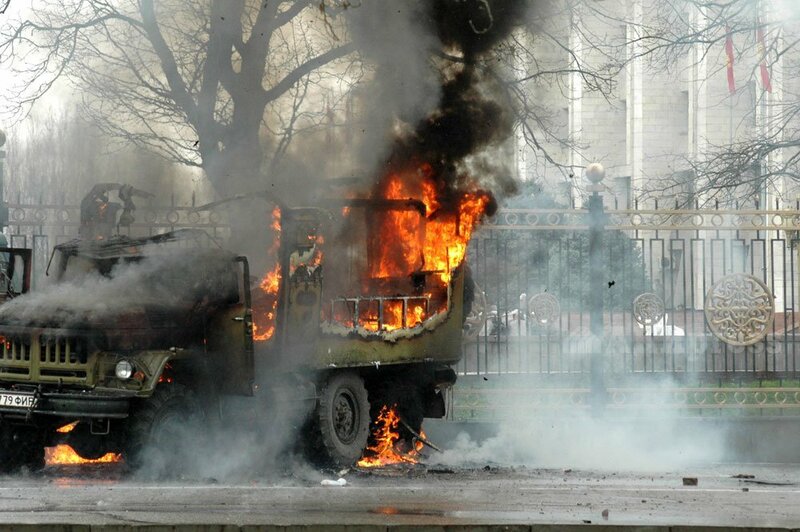 The rioters burned down about 6 police cars and seized two military vehicles full of weapons and even grenade launchers. 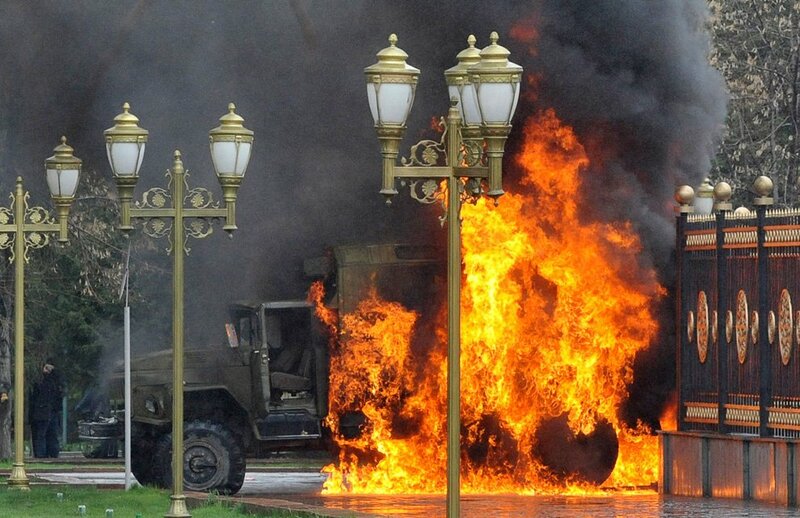 After it, a huge crowd moved toward the White House with two seized military trucks full of weapons. They arrived in the Ala-Too square at about 1 pm. Then people with trucks tried to ram the White House gates, but they were stopped by police, who were likely using plastic bullets as no one was injured and the drivers run away. Riot police again tried to disperse the standing demonstrators and were able to push them away from the White House. The Internal Affairs cadets with shields and helmets lined up in the Ala-Too square. Patrol police officers helped them. 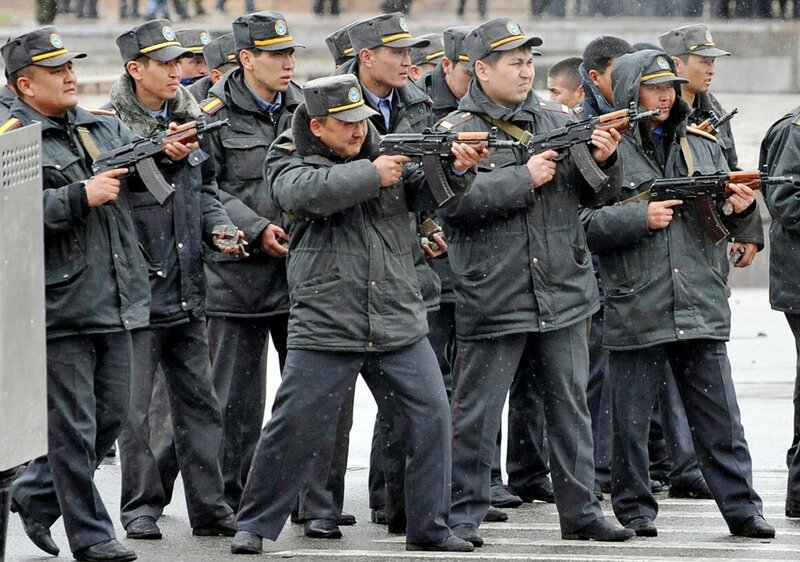 But there were only around 200 policemen and cadets, they were not able to stop thousands of people. About 15 policemen riding horses stood near the Historical Museum and did not take any actions. 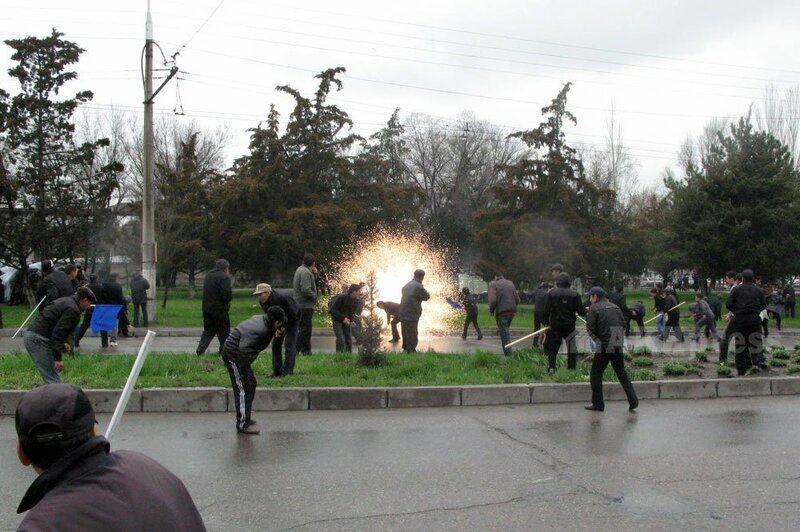 The rioters slowly approached to the forces throwing rocks to them. The second grenade was thrown to the cadets. The line of riot police was broken, the cadets also run away from the demonstrators, those who were unable to run way, were beaten up. Two cadets – Emil Takyrbashev and Nikita Kush – died. After breaking down the riot police, the protesters approached close to the White House and loosened its gates. About 10 to 15 people carrying flags were able get in. In a few seconds, snipers shot them all. This is how the death toll began. A massacre started. Snipers first shot down those who tried to get into the White House, but then opened fire on the protesters behind the fences, too. More protesters joined the demonstrations. From time to time, they tried to seize the White House, but run away after more people were shot down. 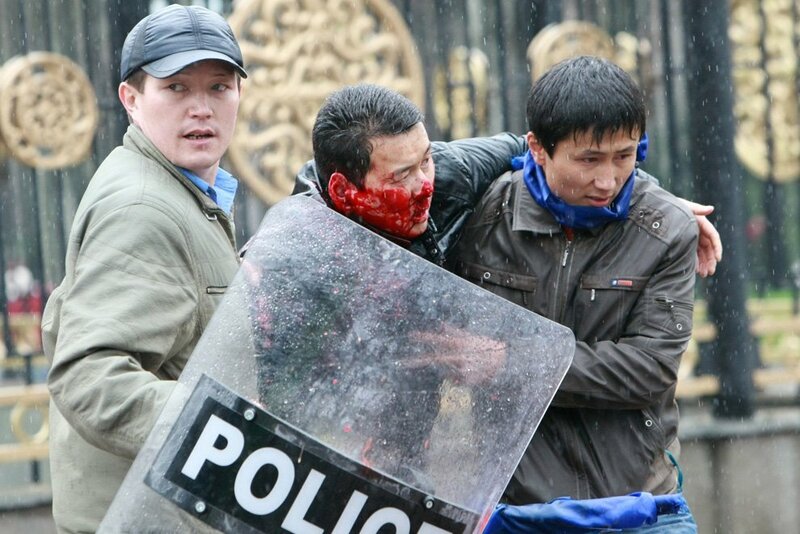 A special hospital located near the Ala-Too square where injured protesters were first sent was full of dead bodies. 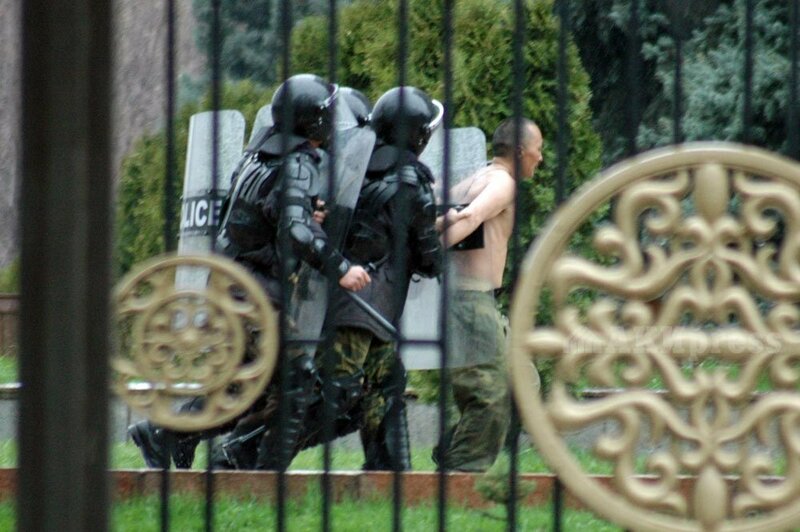 Another group of demonstrators captured then-National Security Council’s building to free attested opposition leaders. The National Security Council was able to withstand the protests for nearly 2 hours and then they let all opposition arrestees out. 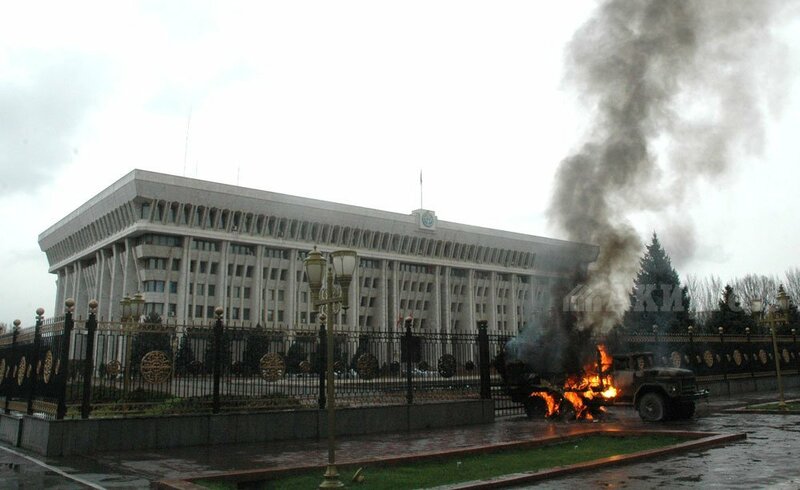 Between 4 pm to 6 pm, the General Prosecutor’s office was burned down, and then the White House was taken by the protesters. Kurmanbek Bakiyev, according to some reports, fled the White House at around 8 pm. It was a turning point of the events. After Bakiyev's escape, the rest of the president's administration staff also fled the White House. 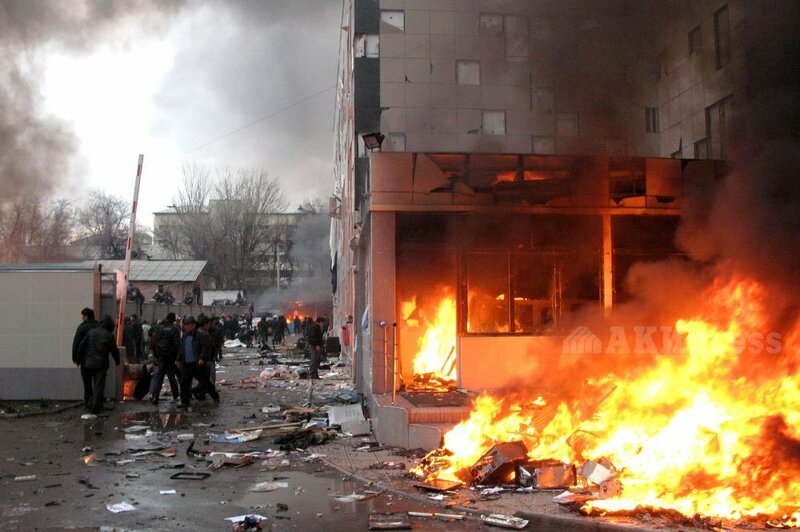 On April 7 night, looting began throughout the city. The grocery store Narodny on the Kiev st. became the first to be robbed, young people drank wines straight next to the bus stop near the store. Another group of rioters robbed the Lion footwear store next to Narodny. 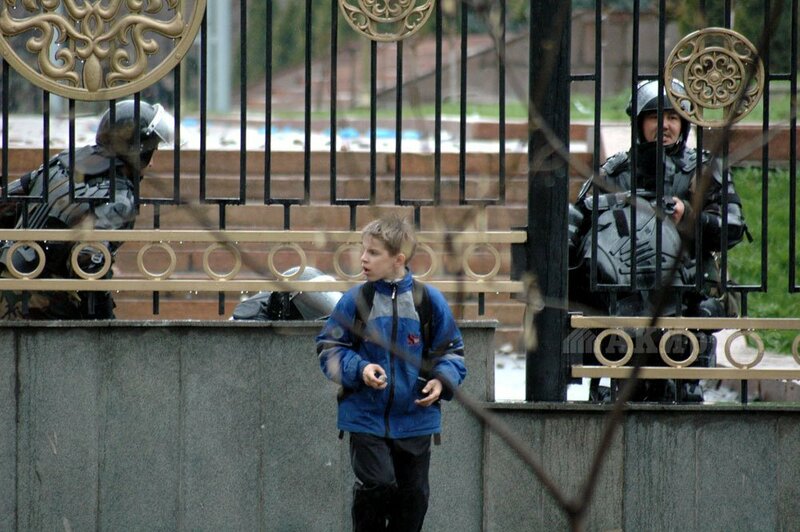 Only then-Prime Minister Usenov and military personnel remained in the White House by the night of April 7. Near the midnight, he also gave up and fled the White House under the solders' guard. After this, the country left without any power. Looting plummeted the entire city on the night of April 7-8. This is how the bloody day ended. 87 people were killed and more than 300 others were injured. 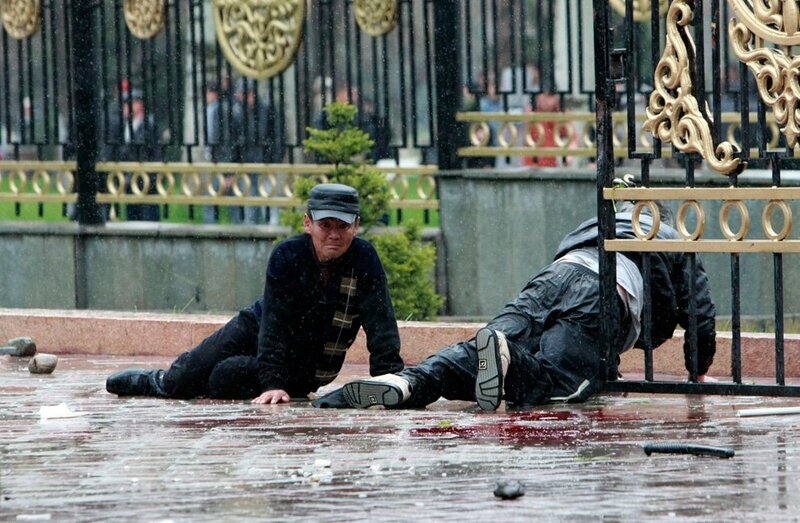 Ousted president Kurmanbek Bakiyev, former chairman of State Security Service Janysh Bakiyev, and ex-Prime Minister Daniyar Usenov were sentenced to life in prison for 7 April 2010 events. The verdicts were rendered by the court on 25 July 2014.